The Stained Glass Rose Window Scarf is one of my newest designs in my Architectural Collection. As I chatted about in my previous blog https://intricateknits.wordpress.com/2014/07/14/architectural-inspired-scarves-gothic-cathedrals-stained-glass-stone-walls/ I adore vintage buildings and the amazing and exquisite architecture of the past. Stained Glass windows have always caught my attention in these beautiful buildings of the past and current. Perhaps that is why about 10 years ago I took classes on Stained Glass and made various pieces for my home. The time, skill and artistry that goes into designing and making one small window is an enormous task, but worth every moment when you see the light dancing through the wonderful colours of the pattern. I have been thinking of designing a knitted version of Stained Glass for a while now and this is one of my first tries. Gothic Architecture incorporates many stained glass windows as the flying buttresses used in design made it possible to have many more windows than previous architecture design. I believe this is a big reason why I love this Architecture so very much. A stained glass window has two sides with different effects on each of them. 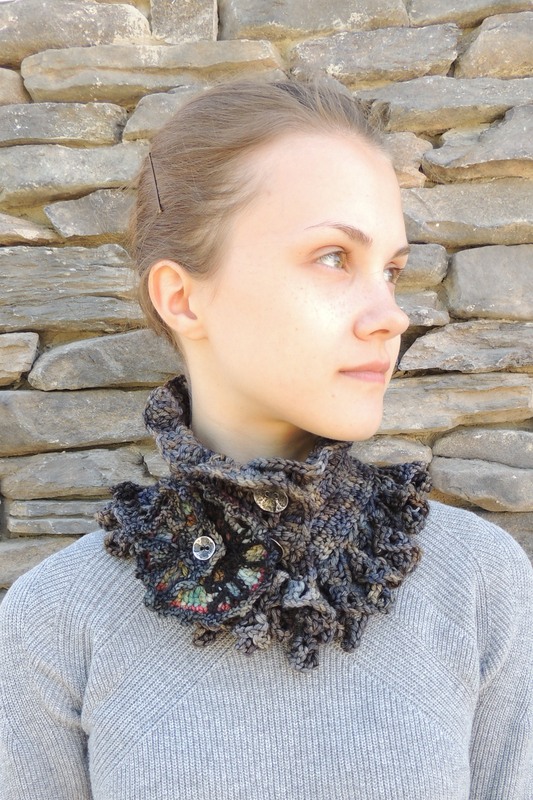 I have tried to portray this in this scarf and the Gothic Stained Glass Rose Window Scarf brooch below. The base is done in a stone coloured hand painted merino wool and other various colours of the same for the stained glass. I have done a crochet trim of crockets that are often seen on Gothic Architecture with pointed arches around the window. The Stained Glass Rose Window scarf is designed with the part of the embellishment reflecting the elaborate stone tracery in a floral shape representing the view of the rose stained glass window from the outside of the building. A small section shows the view of the stained glass window from the inside of the building with the beautiful stained glass colours and the “metal” pieces holding the glass together. Accented with a beautiful metal bronzed button that gives the look of the stone tracery seen on the Architecture of this era. A metal clasp adorns this scarf so you can open the “Stained Glass Window” and wear this Architecturally designed scarf. Tracery and elaborate stone features were an exquisite feature of these beautiful works of art. This design is made with a stone coloured base of beige and neutrals in a hand painted merino wool. The Stained Glass window is accented with pointed arches and crockets seen on most Gothic Cathedrals and buildings of that era. I have added a small clear button on the back of the window to help secure the scarf. That is simply stunning!!!! I’ve never seen anything like it! Yes, I’m going to agree with Leah. It is stunning. I’ve been admiring the look and the creativity behind it. Architectural inspiration in knitting – that is so incredibly creative!. Really great! And I love stained glass windows too. Thanks so much!! 🙂 Really appreciate your comments. I have been wanting to do a collection like this for some time now. Really enjoying it!! Stained Glass Rose Window Scarf was designed last July 2014. 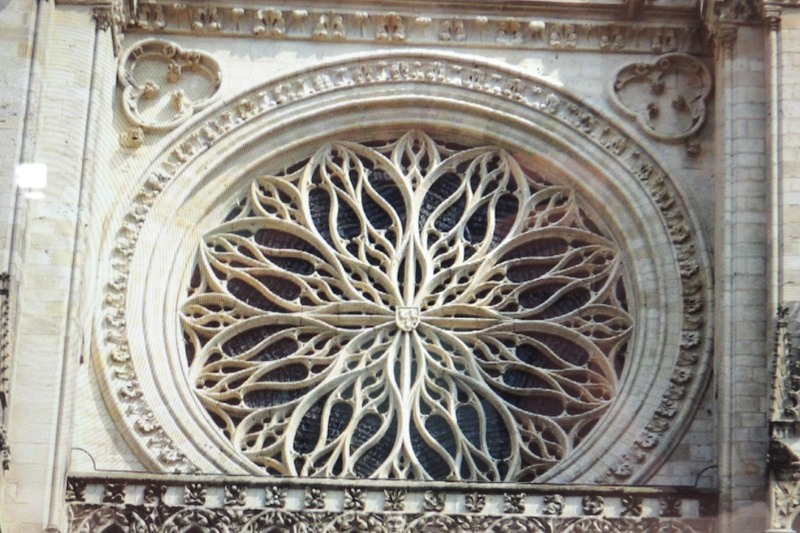 I began my journey with a look into the beautiful stained glass windows and Rose Windows of Gothic Style Architecture. I used to make stained glass a while back for a couple of years. I have always been attracted to the detail and colours on these beautiful works of art and had to find a way to design a similar effect into my designs. I added a sculptural feel with the Rose Window style tracery effect on the outside view of the window with a small section showing the inside view of the same window. You always have to keep in mind with ready to wear garments the time it takes to make the piece so this one is a more general look into the stained glass windows of these stunning buildings. In my project down the road I will be making more detailed representations of the stained glass windows and stone tracery. Off to design some new “Wired to the Past” pieces that will be available for sale down the road. Just working proto-types to fine tune the look I want to achieve. Have your self an inspired day today! !